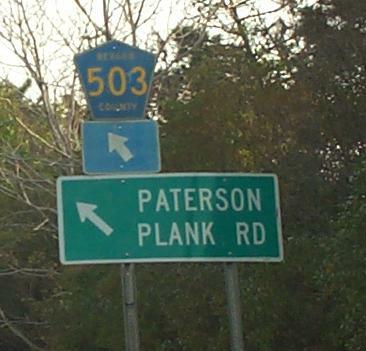 This was NJ 20 until 1988, when NJDOT decided not to connect it to current NJ 20. Both were originally part of the intended route of NJ 3, which ended up taking what was originally built as S-3 (Spur) because 20 never got finished. This history means that NJ 120 could be considered an abandoned child of 20. Bad daddy. SB button copy past Murray Hill Pkwy. at an entrance to the Meadowlands. The main entrance is straight ahead, which is why you see those arrows done up in little flippy buttons, but once in awhile there must be a reason to open this side entrance. As you can see, no sidewalk, and the sign looks like it's been up since the 1970's when the highway was improved. This is the only crosswalk sign on the entire route, serving one of the ten or so bus stops between NJ 17 and CR 503, and the other nine only get a crosswalk. 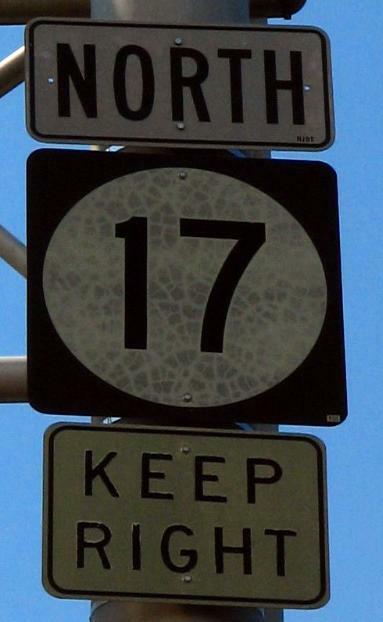 I did only notice this sign on foot, never from the road, so it's not doing any good anyway. 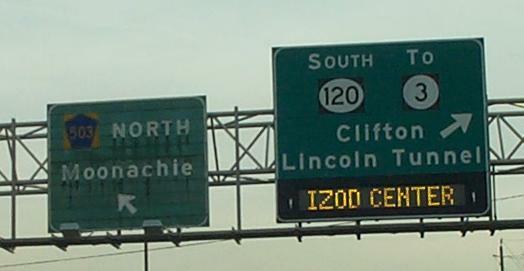 Between NJ 17 and CR 503, NJ 120 is an expressway with a few traffic lights skirting the northern edge of the Meadowlands. Once it hits 503, the traffic volumes that crop up when there's a basketball or hockey game require a freeway from there southward to NJ 3. The two are not multiplexed to 3, so 503 looks like it starts here at least by SB signage. The second photo's gantry is gone now due to Xanadu construction creating a new overpass, but amazingly a good portion of the old signage is still left southbound. I tried to get a head-on photo retake and ended up with sun in my eyes, so there's no clear photo to be had (yet - there's a retake waiting in the wings). 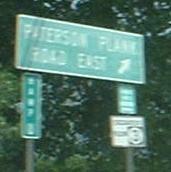 What is clear is that there was once an option for traffic to head right or left at NJ 3. What you don't see is that there was also an NJ 3 WB offramp merging in here from the left, having crossed then-NJ 20 NB at grade and heading to the South Service Road (the now-one way EB frontage road that had been two-way to serve the Meadowlands Plaza). The left exit that now doesn't exist (Secaucus/LOCAL STREETS, with SOUTH SERVICE ROAD on the bottom) once traveled into the median where there was a U-turn ramp to the NB side, then following what is now the NJ 3 EB-NJ 120 NB exit. It had been at that time a two-way ramp with a trumpet interchange, not the current one-way, two-lane ramp. I can't imagine how bad EB-NB traffic bound for then-Brendan Byrne Arena was with only a single lane - and imagine that Meadowlands traffic to NJ 3 EB had to cross 120 NB and South Service Road traffic via a single-lane jughandle! And then left-merge into traffic from the "Local Streets" ramp. 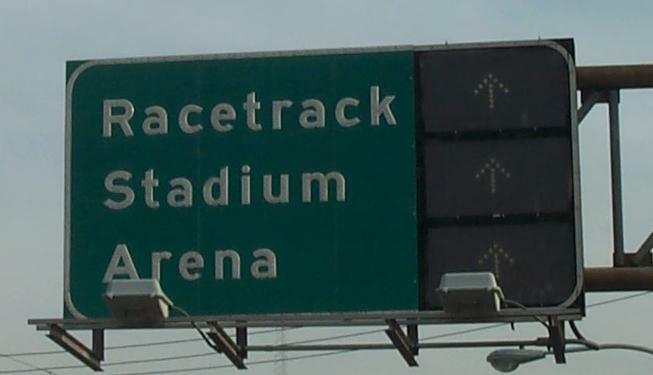 The long-overdue death knell for this configuration was in the 1980's when the Meadowlands upgraded its interior roads and got rid of some of the two-way sections, leaving this SB sign and the scars on the one prior as the only remnants. And now only this is left. Various angles of the new SB-EB ramp under construction (from forward to backward and back again), taken as I drove along the existing one in February 2010. There's a "lanes merge" sign already up for the new ramp although there's no traffic to merge yet. It's only intended to get NJ 120 traffic across NJ 3 for Meadowlands Parkway, not to replace the existing ramp. 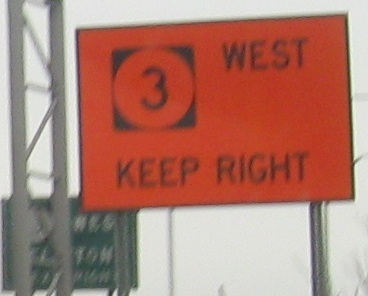 The merging lane is therefore not part of 120, but the entrance from the NJ 3 EB service road. 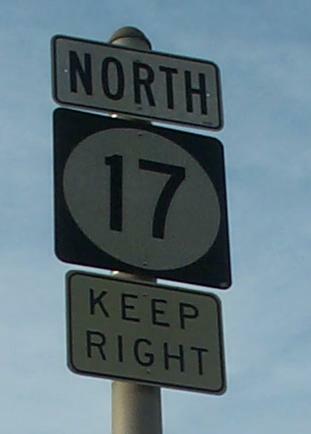 This BGS is technically before milepost 0 on NJ 120, on the NJ 3 EB/southern Meadowlands access road loop that crosses 3 and ultimately left-merges into the NJ 3 WB-NJ 120 NB ramp. Construction brings out the worst in a 3 shield. 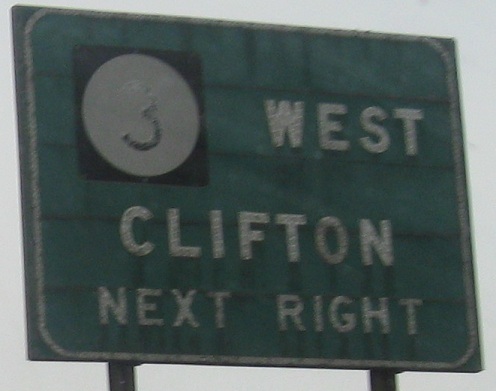 The NB progression on the brief freeway, where you see that CR 503 NB is co-signed with NJ 120, unlike the SB arrangement. 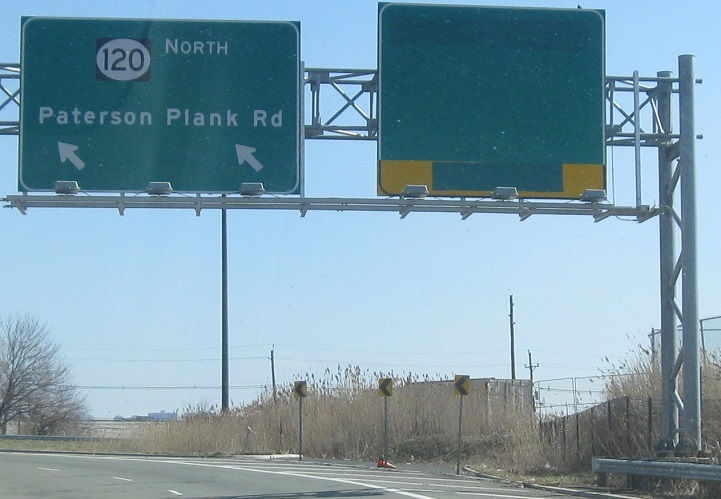 NJ 120 WB is Paterson Plank Road; the EB Plank was partially realigned around the interchange, and ultimately ends in the middle of the Meadowlands (but not before crossing underneath the NJ Turnpike Western Spur). A discontinuous section of the road, the original route that is now NJ 3, runs up and down the hillside in Hoboken, before disappearing in a grid of streets laid over the original route. 13th St. SB adjacent to the railroad tracks that are adjacent to NJ 17. 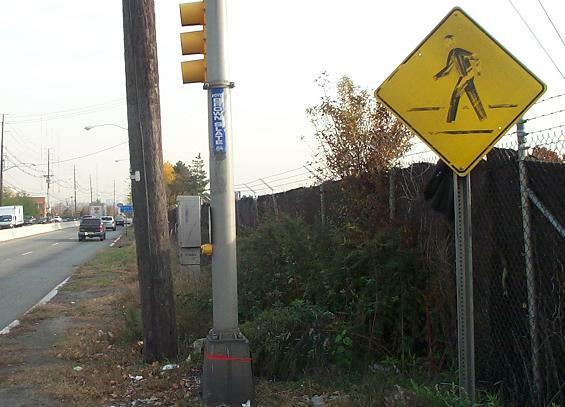 NJ 120 is being widened from 4 narrow lanes to a more generous 6 lanes with wider sidewalks over the tracks. NJ 120 NB, heading west through the work zone. 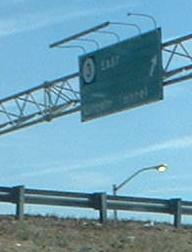 The NJ 17 interchange is just across, and the NB ramp is closed because the top of it is part of the new bridge. 13th St. forms part of the likely detour, which has an at-grade rail crossing just to the north on Broad St.
Paterson Plank Road continues west of here (Murray Hill Parkway) for a short while before disappearing into suburbia. Click for closeup from Scott Colbert.